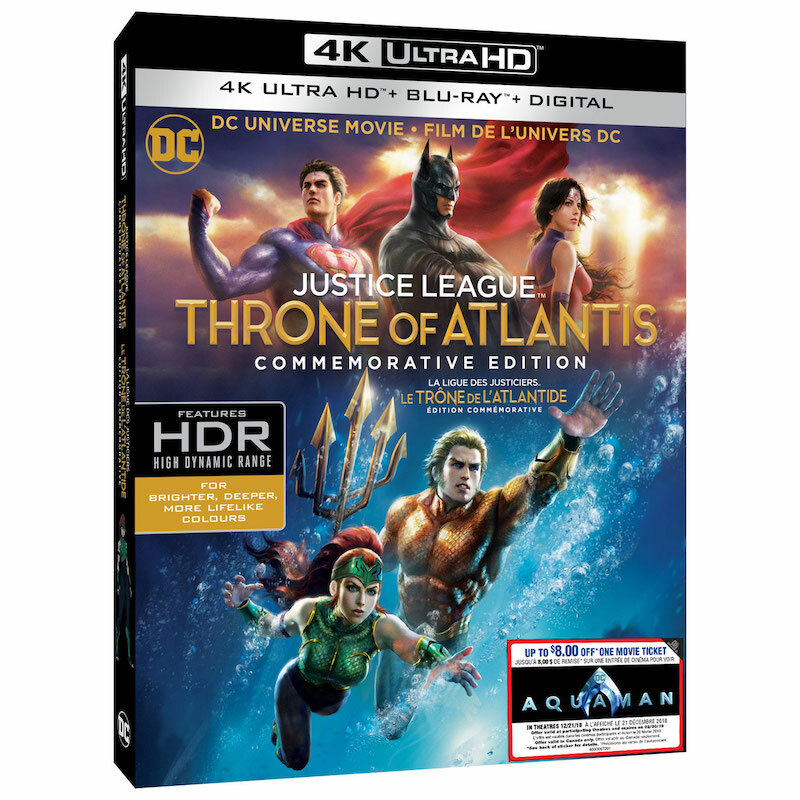 In Justice League: Throne of Atlantis Commemorative Edition, Cyborg discovers an imminent threat in the depths of the oceans so powerful that it rallies together the newly formed Justice League. Meanwhile, wandering thousands of feet above the ocean floor is drifter Arthur Curry, a man with strange powers who may be the last chance to bridge the ancient Atlantean world with our own. Superman, Batman, Wonder Woman and the rest of DC's Justice League must band together as they face off against warmongering Orm, an army of sea creatures, otherworldly weapons and perilous odds. In this all-new epic adventure from the DC Universe, mankind's only hope of escaping from the darkness lies with the guiding light of a man – Aquaman! The celebrity laden cast features primetime television stars Matt Lanter (Timeless, Star Wars: The Clone Wars, 90210) as Aquaman, Sam Witwer (Being Human, Smallville, Star Wars: Rebels) as Orm, Jason O'Mara (The Man in the High Castle) as Batman, Christopher Gorham (Insatiable, Two Broke Girls, Covert Affairs) as Flash, Nathan Fillion (The Rookie, Castle) as Green Lantern, Shemar Moore (S.W.A.T., Criminal Minds) as Cyborg, Rosario Dawson (Sin City, Daredevil) as Wonder Woman, Jerry O'Connell (Real Men Watch Bravo, The Death of Superman) as Superman, Sean Astin (The Lord of the Rings Trilogy) as Shazam, Sumalee Montano (Scandal, Critical Role) as Mera, Sirena Irwin (Superman: Unbound) as Queen Atlanna, and Harry Lennix (Man of Steel, The Blacklist) as Manta. My husband and I have been watching and collection all these DC animated movies since they first started and yes we have been enjoying them very much. 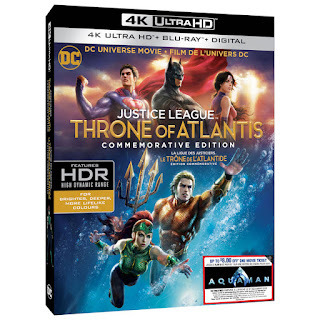 This is a re-release of the Justice League: Throne Of Atlantis movie that came out in January 2015. Anyway, Both my husband and I enjoyed this one. It wasn't one of our favourites but it was entertaining and the story-line was decent enough.